Having secured a ticket for the following night�s concert some time back, the decision to go to this one was a spur of the minute thing. So much so that I had to hurtle across London and chance what I could purchase at the Wembley box office only an hour before the advertised start time. The only ticket I could secure placed me underneath the rafters to the right of the stage, with a partially obstructed view of the front but a good one of what was going on back of house � notably the techs popping back and forth, and the supplementary playing by Julian Colbeck and Milton McDonald. I was also square on to Tony Levin, who I thought did a fine job making sense of the bass parts. On the one hand, he provided the needed low-end substance; on the other, he didn�t try simply to replicate the feel and dynamics of Chris Squire, since his own style and approach is very different, but offered something fresh. The rapport with Bill Bruford obviously worked effectively, as they have collaborated on numerous occasions. 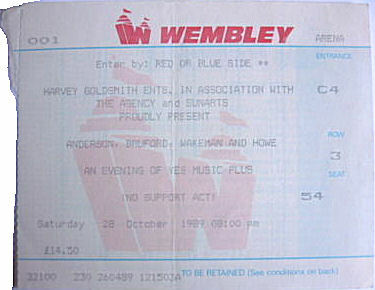 The introduction of the musicians one by one � with Anderson singing a medley backed by Colbeck and McDonald, Howe rendering his acoustic signatures �Clap� and �Mood for a Day�, Wakeman showcasing his array of keyboards, and Bruford introducing his Simmons kit on the back of a light, airy �Long Distance Runaround� � set the evening up well. �Birthright�, one of the stronger numbers on the ABWH studio album, was a good choice of full opener, I thought. It comes across powerfully live, unlike some other new tracks � the harmonies on �Order of the Universe� lacked multilayered depth and resonance, for example. �And You and I� and �Close to the Edge� were the highlights of the evening for me, and I suspect for many present; not least because we probably never thought we would hear a �classic� line up again after the trauma of the early �80s and Trevor Rabin�s remake of Yes into an accomplished stadium rock outfit. �Heart of the Sunrise� worked well, too, though Levin�s metrically straightforward take on the bass solo lacked the emotional power of Squire�s delays and phrasing. This was also the first time that I had seen Bill Bruford play in a Yes context. The electronic kit gave plenty of armour for his precision to cut through the mix. Listening to subsequent recordings of this tour leaves me less than satisfied with the way the electronic drums tend to overpower the music (flattening the dynamics at the same time), but the combination of force and detail gave this concert a real presence� and, for me, reinstated the centrality of the music that makes Yes music what it truly is. I realised as I came out at the end that this was the 12th anniversary (to the day) of my first Yes live experience, at what was then the Empire Pool Wembley, on 28th October 1977. This more than made up for the last 'Yes' appearance in 1984. It was a fantastic experience, especially seeing Rick with the band again. The oldies were played in the style of their original recordings. As I remember, AYAI and Roundabout were given a more acoustic treatment with Steve Howe being augmented on stage by other musicians. The lighs and sound were superb (for Wembley anyway) and the beginning of the show with Jon's walk through the crowd was really unusual. The show didn't get going properly for about 20 mins, once all the band were on stage after the solo spots. Tony levin was utterly incredible, and a real match for Chris, although their styles are quite different. The bass work was much better than the Jeff Berlin concert that was released as a live CD. I left afterwards wanting more, and feeling that it was most definately Yes I had seen and not any group of imposters!